The mobile experience is simplified yet striking. 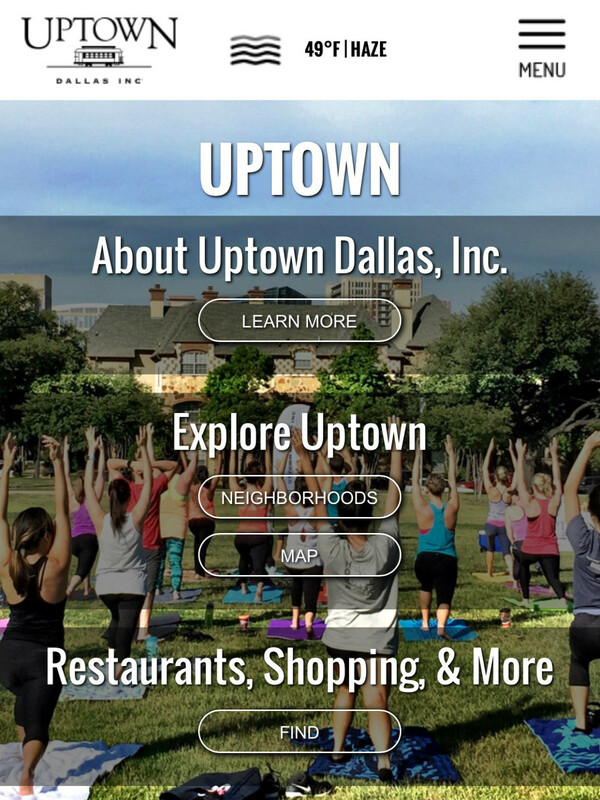 Photo courtesy of Uptown Dallas Inc.
UDI's new website design lets you explore by neighborhood. 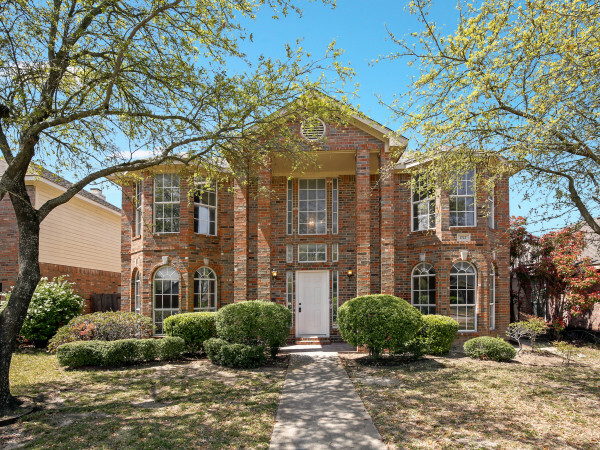 Photo courtesy of Uptown Dallas Inc.
Find what you're looking for quickly on the map. 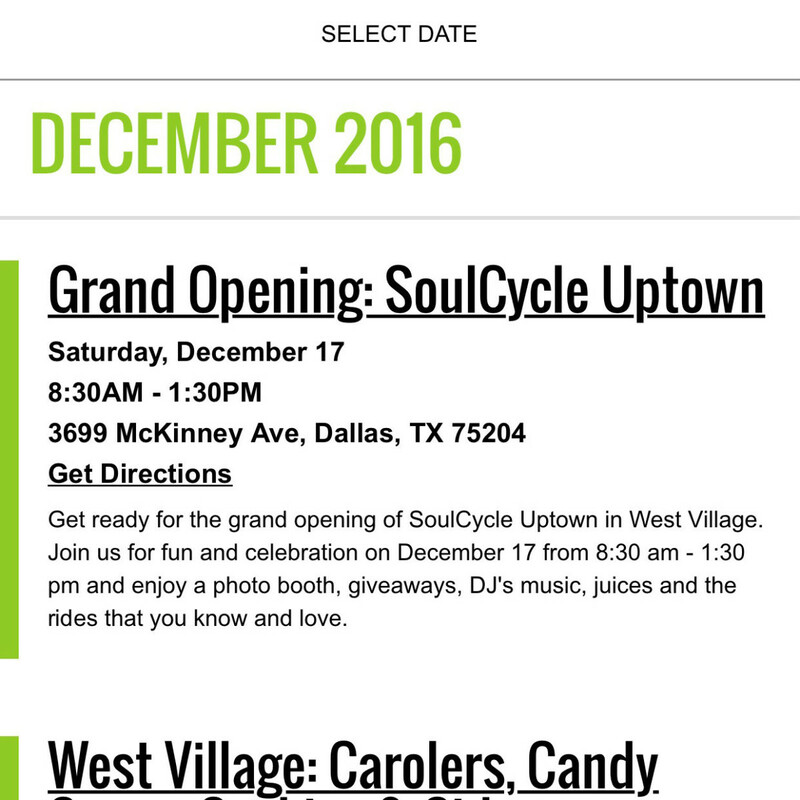 Photo courtesy of Uptown Dallas Inc. Looking for something cool to do? Checking out events on the go is easy. 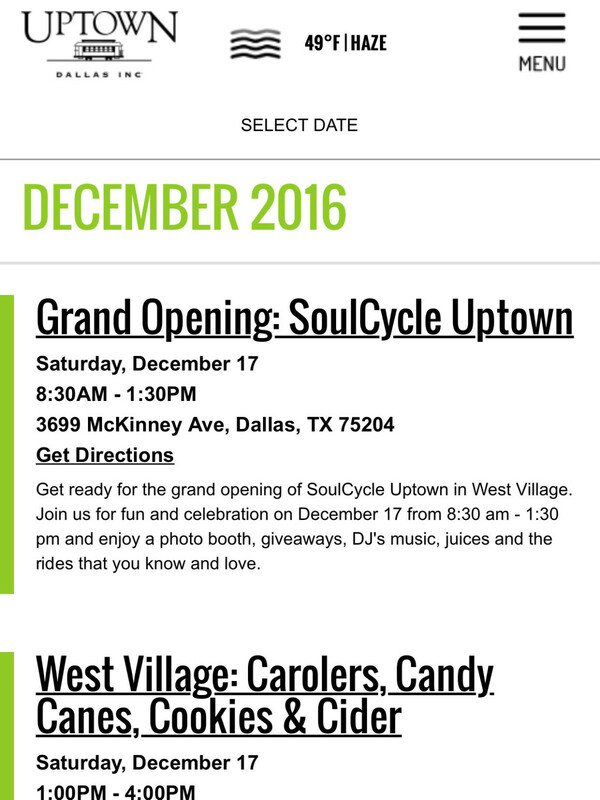 Photo courtesy of Uptown Dallas Inc. 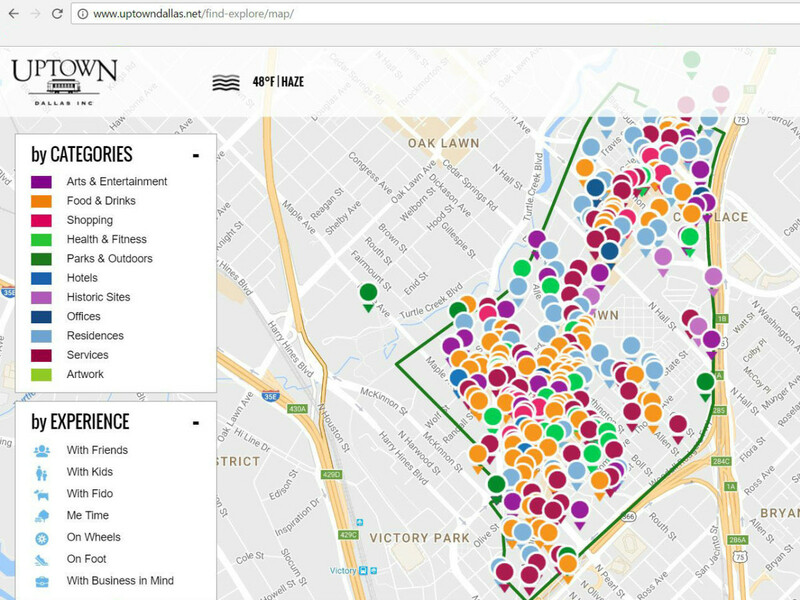 The redesign serves as an intuitive guide for locals and visitors alike. Photo courtesy of Uptown Dallas Inc. 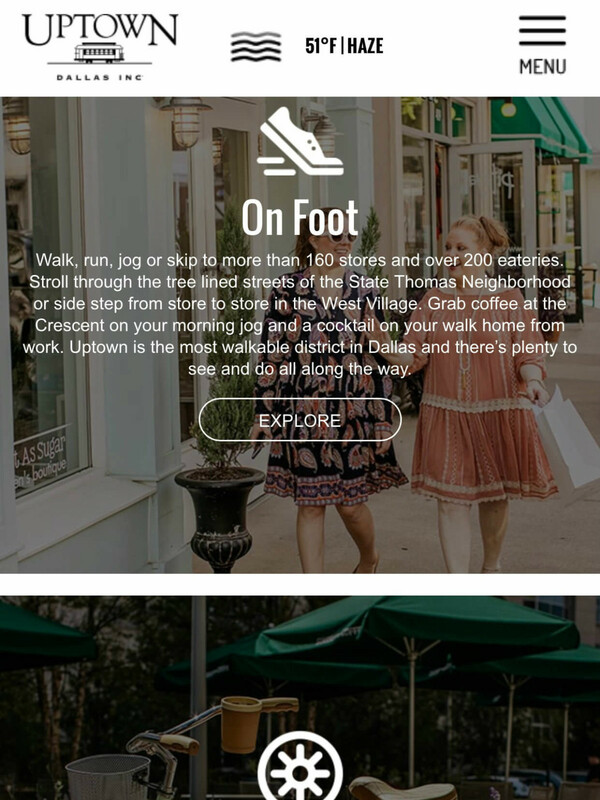 Exploring Uptown, with its vibrant mix of restaurants, shops, cafes, and parks, is always a joy on foot. 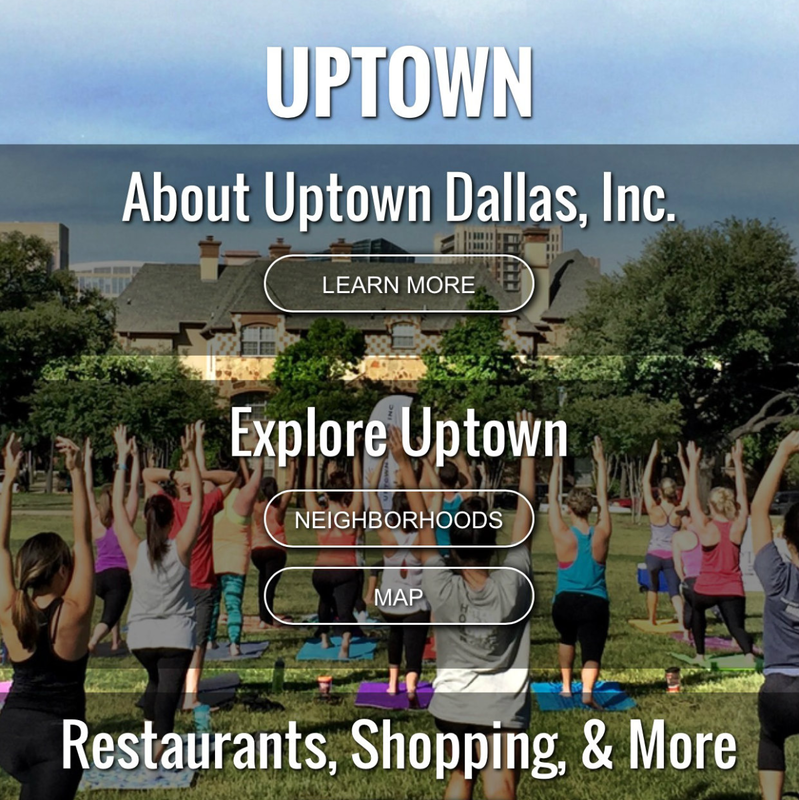 But now it’s just as much fun online, thanks to a fancy new redesign of Uptown Dallas Inc.’s website, UptownDallas.net, that puts the neighborhood at your fingertips. 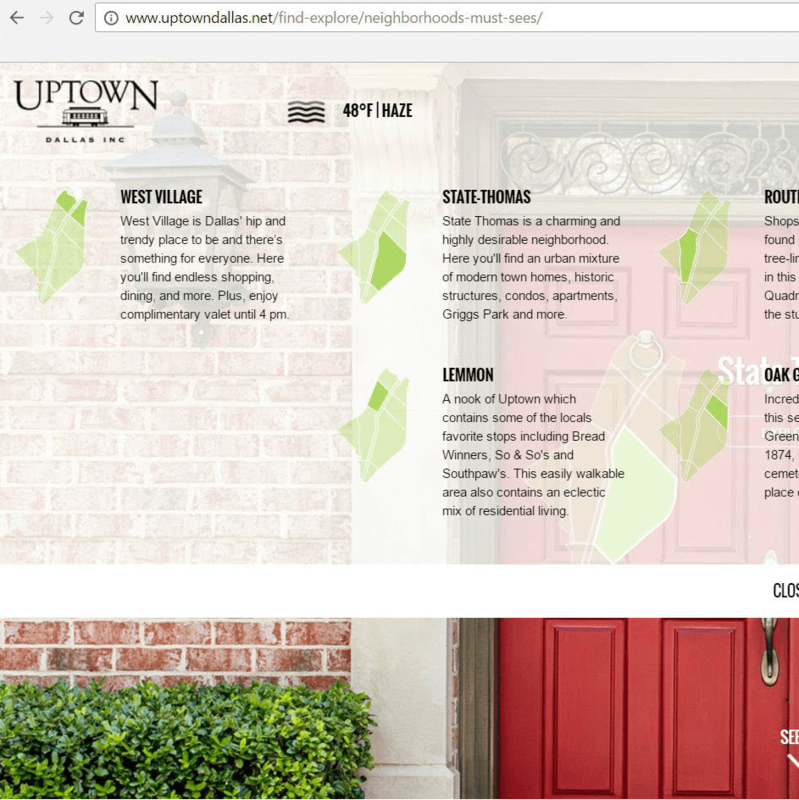 Uptown Dallas Inc., you'll recall, is the public improvement company of the premier, pristine, and highly sought-after Uptown district. 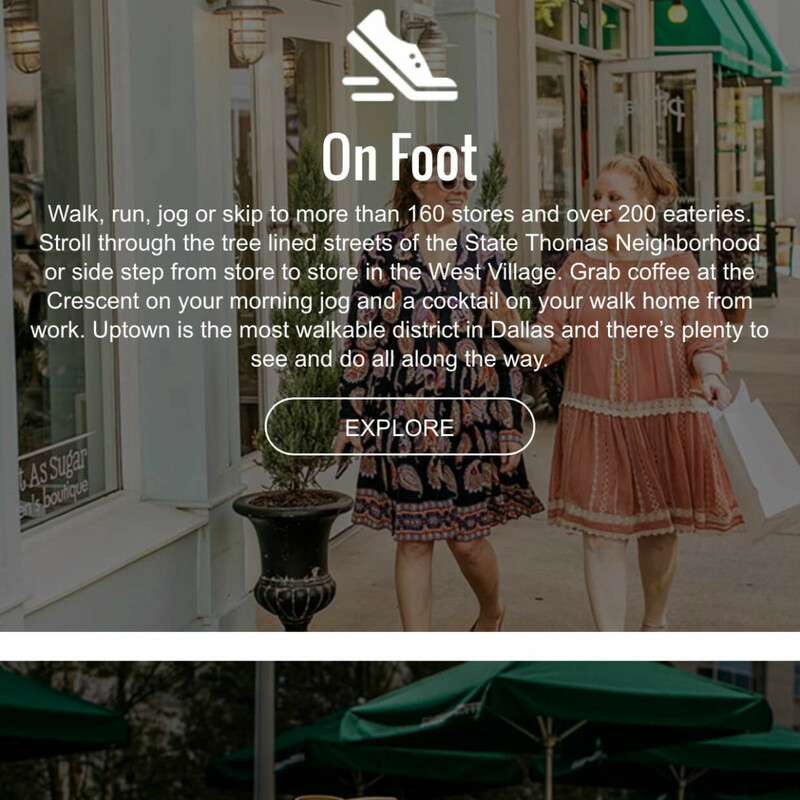 The revamped website makes it easy to fully plan out your Uptown experience, whether that means a day filled with kid-friendly adventures or a sophisticated night on the town. Want to know which restaurants will welcome your pooch? Where you should power lunch with a client? 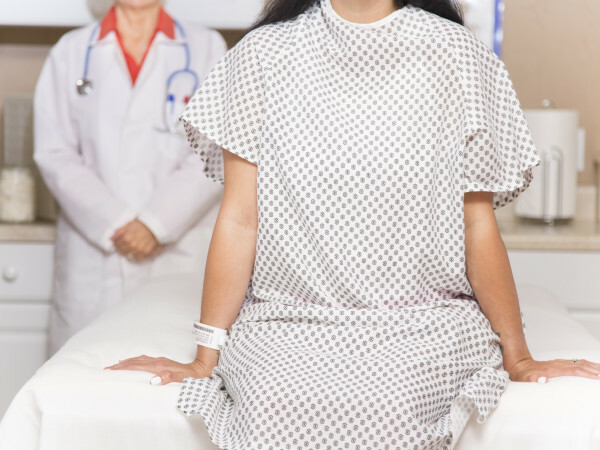 What boutiques might have opened since your last visit? What are the cranes high in the sky up to? Browse by experience or search by category, and find exactly the info you need. 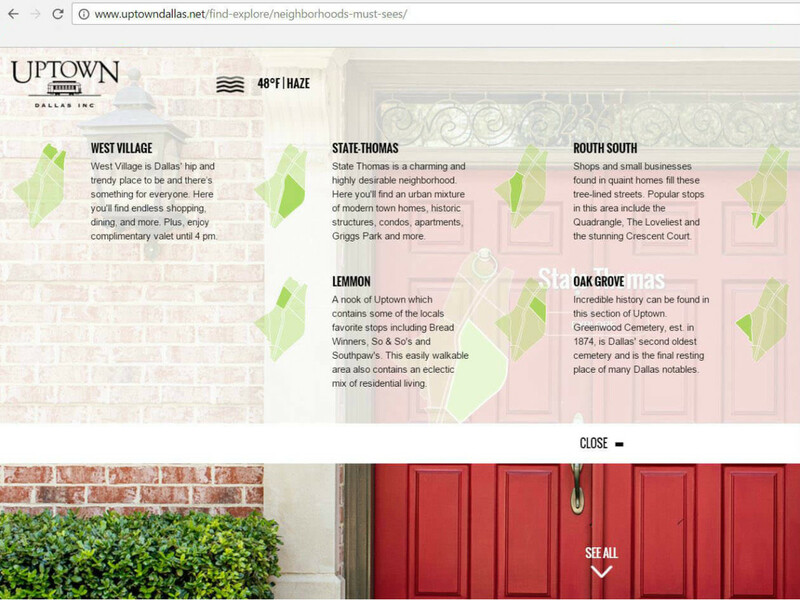 And whether you’re new to the neighborhood, a frequent visitor, or an Uptown expert, the website provides a glimpse at the diverse sections that make Uptown the heart of Dallas. Don’t forget the crowd-sourcing, either. 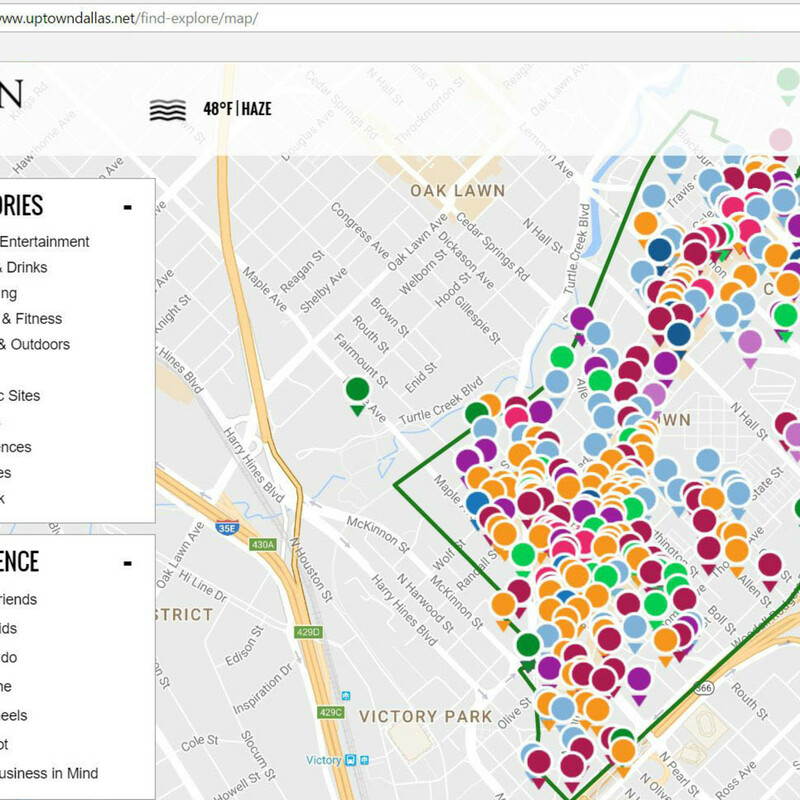 @UptownDallasInc captures social media posts that tag #UptownDallas and #LoveMyUptown, giving you a real-time snapshot of what people are enjoying around the area. There’s also an opportunity for reader-submitted stories, sharing first-person accounts about fave restaurants, memorable trolley encounters, first dates, and more. As a bonus, the new website is a visual feast. Stunning images populate each page, showing you in full color the beauty that is Uptown. Now all you have to do is get out there and see it in person. UDI partnered with digital agency GDD Interactive on the site. The majority of photography is by Jeremy Enlow.